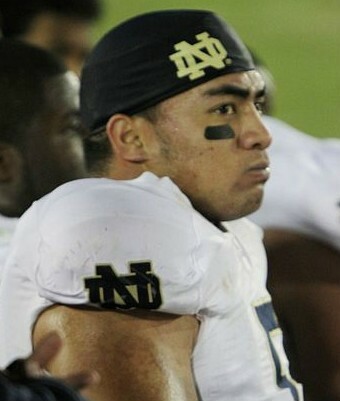 Manti Te’o has been a very good linebacker for the Notre Dame football team. In fact, he was a Heisman candidate, who became the runner-up for the trophy. However, the good judgments he made on the field do not translate into good judgments off the field. Te’o gained a lot of sympathy votes this past season with the death of his grandmother and his girlfriend within the span of 24 hours. As it turns out, the girlfriend, “Lennay Kekua,” was a hoax. The question at this point is, was Te’o a victim or a perpetrator of this hoax? Prior interviews with Te’o and his father Brian strongly suggest that this girlfriend was real outside of mere online communication. Te’o talked about how beautiful her character was, and how she always pointed him to God. Now here’s what is really interesting to me as a Christian thinker… Te’o’s a Mormon, and this whole affair is illustrative of a much bigger problem with the Mormon faith in general. Of course we are all sinners, but Mormonism actually fosters 1) lying and 2) naivety. As such, we should expect more of these things among Mormon people despite the fact that they come off, by and large, as really outstanding people. Justifying lying in Mormonism finds a basis in its own scripture. There, contrary to the biblical account, the Lord commands Abraham to lie about Sarai being his sister (Abraham 2:21-25, Pearl of Great Price). As such, Mormons employ something similar to the Muslims’ “taqiyah,” which allows them to lie in protecting their faith. For more on this, see here. So in the mind of a college kid, it would not be surprising if Te’o somehow thought that his popularity, and thus that of his Mormon faith, stood to be furthered by lying about his girlfriend. Then again, even if it wasn’t for the furtherance of his faith, we would expect that lying in the most important area of one’s life--one’s faith--would easily spill over into other areas of one’s life. On the other hand, perhaps Te’o genuinely was a victim of an online pretend relationship. If so, Te’o is a typical Mormon, who has easily fallen victim to a scam (e.g., see here). Mormonism teaches its members to know that their faith is true, but this knowledge is merely experiential or subjective. LDS missionaries encourage potential converts to read the Book of Mormon, study it, and then pray sincerely about it to know its truthfulness (cf. Moroni 10:4-5). Mormons typically think this knowledge is sufficiently communicated by what is known as a “burning in one’s bosom” (cf. D&C 9:8-9). There is no need to study the evidence out in an objective way. There is not even critical thinking concerning their leaders’ statements. "When our leaders speak, the thinking has been done" (Improvement Era [June 1945], 345), and Apostle Boyd K. Packer's stated, "The dangers I speak of come from the gay-lesbian movement, the feminist movement (both of which are relatively new), and the ever-present challenge from the so-called scholars or intellectuals" (Talk to the All-Church Coordinating Council, May 18, 1993). So, we would expect that naivety in the most important area of one’s life--one’s faith--would easily spill over into other areas of one’s life. This was poignantly displayed in the Mormon film Brigham City. Jesus taught that we should test a tree by its fruit (Matthew 7:15-27) and that we are to be wise as serpents (Mat. 10:16). Neither lying nor naivety are Christian virtues. The Bible also says to "test all things and hold fast to that which is good" (1 Thes. 5:21). The Bible also teaches that "there is a way that seems right to a man, but the end thereof are the ways of death" (Prov. 14:12). The testing of truth presupposes that truth is something to be valued. Reality, more than one’s sincerity, is what matters! One may feel happy in one’s beliefs, but if they don’t comport with reality, then reality is going to bite them in the end. I genuinely am sorry for Te’o. I imagine he’s feeling a lot of shame now. However, imagine the shame he and the rest of his church will feel on the day of judgment! I pray that the truth will soon come out of this whole sordid affair, but more importantly, I pray that he will come to know the Truth, who can change his life more into His image. "Rob--perhaps you catered this article to those who share your bias against Mormonism, because I can't think of anyone else who would be so ready and eager to overlook its blatant unfairness. You set a double standard by acting as though no "true" Christian has ever had to choose between the lesser of two evils. For example, would God condemn a 1st century Christian for lying to a murderous persecutor about where his family was hidden? To claim that your Abraham example somehow teaches Mormons to value lying is beyond ridiculous--we are simply realistic enough to know that this fallen world will sometimes present difficult moral dilemmas where the lesser of two evils must be chosen. Abraham's lie to evil murderers to subdue their depraved impulse to kill was clearly the simplest, least obtrusive way to achieve the higher good. Of course only God can judge whether or not such choices are made for the right reasons, but your umbrella condemnation makes you come across as the ultimate legalist. Your accusation of naiveté is equally questionable, as it clearly hinges upon your personal bias against the Mormon version of Christianity. Considering again the simplest means to an end, do you think God would establish His gospel over many centuries of evolving theological speculation and debate, or would He simply follow His Biblical pattern and call another prophet? Are Mormons so unreasonable in affirming that the second option is the only viable one? In my opinion, it seems much more naive to rely on theologians whose wildly divergent theories proved an absence of revelation from God. What their writings do confirm is that in the absence of revelation, they were not above relying on human wisdom. For example, I was recently reading Clement of Alexandria’s praise (and quotation) of Xenophanes’ treatise on why God can’t be anthropomorphic. Clement, a convert to Christianity whose prior education was steeped in Greek philosophy, clearly respected Xenophanes’ and other Greek philosophers’ shift toward monotheism, and thus thought it natural to accept other attributes of this speculative Greek version of monotheism—attributes like immateriality and incorporeality (despite abundant Bible assertions to the contrary). Origen, a pupil of Clement, continued this trend by affirming his appreciation for the Platonic concept of “The One”, which Middle Platonist Plutarch described as follows: “Socrates and Plato held that (God is) the One, the single self-existent nature, the monadic, the real Being, the good: and all this variety of names points immediately to mind. God therefore is mind, a separate species, that is to say what is purely immaterial and unconnected with anything passible [i.e. changeable]”. It’s impossible to dismiss the similarities between this Platonic description and the Mainstream Christian concept of God--so I ask, did the post-apostolic theologians popularize attributes such as “self-existent”, “separate species”, and “immaterial” because they are unmistakably taught in the Bible, or because of their unabashed appreciation for this Greek philosophical version of monotheism? The answer is undeniable, which is why God needed to call a prophet to correct the human corruption.